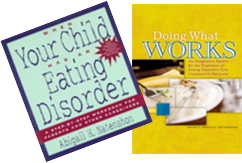 "As the Director of The New York Center for Eating Disorders, I have read every book on eating disorders! Doing What Works is a beautifully written. This comprehensive guide to the treatment of eating disorders is a masterful book for both experienced clinicians and those new to the field. Ms. Natenshon, a psychiatric social worker, weaves together the "neurological, physical, nutritional, behavioral, chemical, emotional, developmental, psychological, and relational issues" which richly illuminates the depth, breadth, and complexity of eating disorders. In this sophisticated exploration, Doing What Works also describes a wide range of treatment strategies including guidelines for family therapy, group therapy, child therapy, hospitalization, medication, and mind-body techniques (Feldenkrais and Anat Baniel methods) so the therapist can formulate an individualized and integrated approach for each client. Ms. Natenshon encourages the therapist to actively reach out to connect with "the client's core self, which has been imprisoned by the impenetrable armor of the eating disorder." The growth-promoting safety of the therapy relationship enables the client to "reintegrate the 1000-piece puzzle of the client's holistic self that has been exiled." The author's enthusiasm to leave no stone unturned in helping her clients recover lends a vitality and energy to this book. In these times of managed care, where treatment results are often measured numerically for effectiveness, the human dimension of the therapy relationship can get undermined. But it is this human dimension that forms the key and most crucial intervention that Ms. Natenshon draws on to heal her clients; she is not afraid to show her affection and her authentic self to foster the growth of the client's most authentic self. 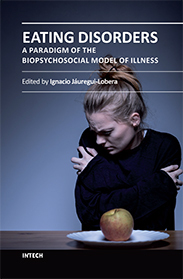 I wanted to let you know how much I have enjoyed and learnt from your bookDoing what works: an integrative system for the treatment of eating disorders. I spend most of my time these days working at the University of Tasmania, but still run a small private practice. Services are extremely limited here in Launceston, Tasmania; although children and adolescents have access to treatment which is free via a Child and Adolescent Mental Health Service (CAMHS). It must be great to be able to access appropriate levels of care and services for clients of all ages! Often my job is to pull together a team of GP and a nutritionist (dietician over here), and we try to offer the best service we can with limited resources and no inpatient service for ED adults, unless they are ill enough to require medical hospitalization (general medical ward) or psychiatric services, via the public system. It is uplifting to read about your stories of recovery and the cautions around this. So often clients are not fully recovered and their lives remain compromised anddriven by their disorder, despite ‘close enough’ weight gain. I will definitely be guided by your approaches to this issue. "I truly believe that this book should become integrated as a mandatory reading for ALL beginning therapists because in their quest to use as many theoretical models as possible from their classes in daily practice, they often forget the most important contributor to positive outcomes in therapy... The integrative use of self. I myself, am learning more and more with every page I turn, and feel inspired by having read this book." "Doing What Works is packed with invaluable information about the complex layers of eating disorder treatment, making it an important contribution to the eating disorder treatment field. It is truly an invaluable guide for therapists new to the field, and even those with substantial experience will find tools and resources they can add to their repertoire. The way you write is great---it seems like part clinical wisdom and part academic review, and most of the references are current and scholarly. You are so generous with what you have learned over the years in providing such important information and guidance for readers …this is clearly a labor of love." "I am just getting into the field of eating disorders and this book has been a perfect introduction for me. It has also gone further, going into great deal about the various treatment options that have proven effective with this population. I think this book will prevent a lot of reinventing the wheel for clinicians working with eating disorders. I would definitely recommend it." "I have been counseling girls with eating disorders for about a year, but I feel extremely inadequate. I tend not to treat the eating disorder, but rather to just treat them as teenage girls with problems. It is such a challenge to get them to believe they should eat when everything in them says food is the enemy. I just want to say to them, "Eat anyway. You're not thinking straight right now and you're starving yourself to death." Eventually, I can usually say that, but I really need your book. Thanks for writing it." "It made me realize how proud I am to be a therapist and how excited I am about doing this work. The writing was so personable, clear, and easy to read…it was like sitting in the same room with you and your patients, as if you were speaking to me, personally." "This book has accomplished what the eating disorder treatment field has been needing… a workable meld of scientific research and clinical practice. In bridging this gap, it offers strategies and applications that are practicable and make sense not only to clinician son the front lines of treatment, but to their patients in recovery." "All too many of us doing this work have been essentially on our own; we are doing what we know how to do. It is apparent that such efforts have not been sufficient. It is high time that we have access to a resource that offers clarity in describing what aspects of this treatment differ from general practice, better preparing us to manage these cases towards successful and timely outcomes." "I loved your book, and think it would make a splendid text in the classroom at many levels. Your command of this wide field is masterful." C.L. "I wanted to let you know that I have started reading Doing What Works and love it so far. It is refreshing to read your thoughts that healing occurs partially through relationship, which feels very inclusive for me as a dietitian. A psychotherapist recently accused me of working outside of my scope of practice simply by taking on patients with a mental illness, saying that nutritionists do more harm than good and have no business within eating disorder treatment. It is helpful and legitimizing to read in your book about the importance of the nutritionist's relationship with the eating disordered client, and of fully understanding the disorder and how it heals. I just wanted to tell you how much I am enjoying your book." "As a nutritionist working in the field of eating disorders, I applaud this greatly needed resource. Eating disorders is a separate and challenging specialty in the field of nutrition. Often puzzling, frustrating and ultimately so very rewarding, this is a field that hasn't been thoroughly explored in such a manner...until now. The eating disorder nutritionist is more than an educator of scientific and nutritional facts. The emotional component of these complicated disorders requires a thorough understanding of the underlying issues as well as an ability to handle them as they impact the individual's recovery process. As a significant member of the eating disorder team, the nutritionist collaborates with other team members, facilitating the exchange of information to provide the most comprehensive standard of care. Treating eating disorders requires unique education, training and interpersonal skills which are often not adequately taught in college or graduate school. Therefore, the nutritionist is often left to search for manuals, methods, and mentors to hopefully fill the gaps in education. The search is over. This book has it all and more. Doing What Works is filled with critical information presented in a clear, empathetic manner while also covering all aspects of the integrative system for the treatment of eating disorders. It's a must read for any nutritionist working in the field of eating disorders because it finally is what really works. "What a delightful surprise that a professional book about treatment could be so engaging and actually fun to read. I found that it had such flow and was so interestingly written that I didn't want to put it down." "The information is wonderful...clearly a never been written addition to the field. I am engaged and enlightened."